Description: Colonial Empire. (Set of 20 Cards). Introducing Malaya and Borneo. Introduction pages and decorative map. Our Catalogue Reference: Part of CO 1069/493. What year was this album published? I'm afraid we don't know. Since it was produced by the Central Office of Information it must be from after 1945 and since Malay(si)a gained independence in 1957, it's presumably from before then. The fact that it uses the term 'Empire' (rather than Commonwealth) might suggest it is from closer to the earlier of those two dates. Thanks for your response. I think it's pre 1957 and pre-Malaya's Independence too. This statement on the last page "can now build up a common loyalty to the Federation of Malaya." perhaps implies the coming Independence. 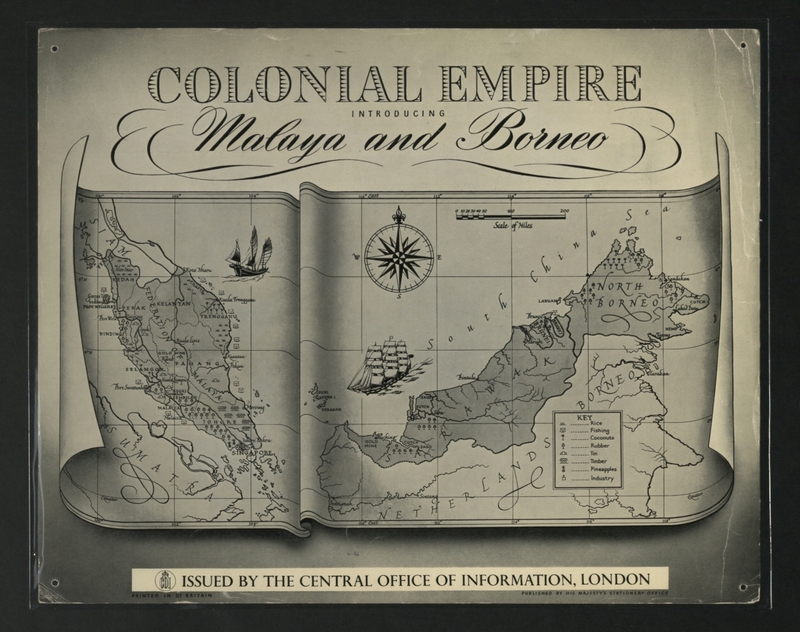 It is however a significant album as it imagines the British territories of Malaya, Singapore, Brunei, North Borneo and Sarawak together - collectively and pre-empts the new country-to-be 'Malaysia' before the idea of 'Malaysia' was first publicly announced by Malaya (and Malaysia's) first Prime Minister Tunku Abdul Rahman in 1961. Malaysia came to be in 1963 by signatory territories of Malaya, North Borneo (now Sabah), Sarawak and Singapore (expelled in 1965) and Brunei opted not to be part of Malaysia. Anyway, very timely for our nation's 50th anniversary next year in 2013. So thanks National Archives UK!